Where's my $65,000 tax refund? The Long family is still waiting for a $67,000 tax refund, after adopting four children last year and claiming the adoption tax credit back in February. NEW YORK (CNNMoney) -- Tina and Kenny Thomas filed their taxes in February and are still waiting for their refund. The Thomases are expecting a whopping $65,000 check from the IRS this year, thanks to the adoption tax credit they claimed after adopting five special needs children from foster care over the past few years. The refund was supposed to arrive on May 3, according to the "where's my refund?" tool on the IRS website. They're still waiting for a check. 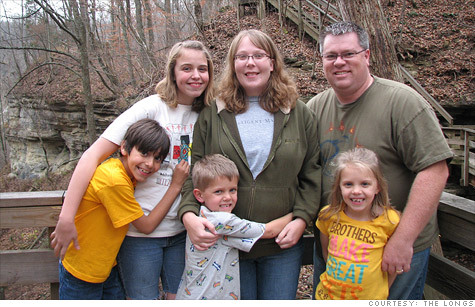 The family is buying a home in foreclosure for $55,000 and agreed to pay cash with their refund. But the check didn't arrive by their closing date. They've already extended the closing date once, but if they don't get the money by June 13, they may lose the house. "We are frustrated because [the IRS] knows they owe it," said Tina. "If we owed them, they would be charging us hundreds of dollars in interest. It's a lot of money so it seems like they're trying to prolong it as much as possible." While the couple finally received about $5,000 -- the portion of their refund that doesn't include the adoption credit -- they have yet to see the bulk of the money. Thousands of other Americans who adopted children over the last five years and filed for the adoption credit are in limbo as well, waiting for similarly large sums from the IRS. The adoption tax credit gives parents who adopt children as much as $13,170 per child -- up from a cap of $12,150 last year. And this is the first year the credit is refundable, meaning the money goes directly into a qualifying taxpayer's pocket, rather than being applied to future taxes owed. That's especially helpful for lower income families because they get the cash even if they don't owe any taxes. A typical private adoption runs about $30,000, so the credit was intended to help families by reimbursing expenses, such as court fees. Parents who adopt children with special needs, however, can receive the entire credit even if they had no expenses. But because of the huge amounts of money adoptive parents are claiming this year, the IRS is being extra vigilant before it doles out thousands of dollars. They tried to deduct what?! Andrew Long and his wife still haven't received the $67,000 refund they say they're owed, after adopting four children with special needs last year. "The new adoption refund is going to be very helpful, once the IRS decides to give it to us," said Long. The Longs recently received a check for about $12,000 -- the portion of the refund that didn't include the adoption tax credit. But they have yet to see the remaining $55,000. In its latest report on the tax filing season, the Treasury Inspector for Tax Administration found that, by the end of April, the IRS had received returns from 72,656 taxpayers claiming more than $897 million in adoption credits. About 58% of those claims were sent for further review, and will be audited to verify that proper documentation was submitted and that the amount of money being claimed is correct. The IRS didn't provide an average timeframe for resolving these additional examinations. Long said the IRS sent him multiple letters asking for the same paperwork he had already attached to his original return in February. After re-sending the documents in April, he said his tax refund status online still hasn't budged from "under review." When he called to see what was going on, he said a representative told him that all adoption credit returns are being audited this year. The IRS has acknowledged the issue, but says the delays are largely coming because taxpayers are filing improper paperwork or are missing documents. "We recognize what an important credit this is for people who are adopting, since the dollar figure on this one compared to other refundable credits is very large," said IRS spokesman Terry Lemons. "But we have people who are trying to game the system all the time, so we're kind of stuck in the middle -- we know parents are counting on this money, but we're also trying to make sure each claim truly qualifies." This may explain why parents like Deborah Schwinger, the new mother of two adopted siblings, have been left in the dark. Schwinger also claimed the adoption credit, and said she's supposed to get $24,300 back from the IRS. She received the part of her refund excluding the adoption credit, and says the IRS continues to send her letters notifying her of further delays. "No adoptive parents, that I know, have actually gotten the money -- everyone's return is being reviewed or delayed," she told CNNMoney. "I think many people may give up." As they wait, many confused and angry adoptive parents across the country are flocking to an online forum on Adoption.com. A thread dedicated to the issue contains 85 pages filled with comments about refund delays. But some families are winning the waiting game. The Wards, from Smithfield, North Carolina, were one of the few families that have received a refund from the adoption credit -- totaling $54,000 -- after adopting five kids over the past five years. They've been waiting since January, when they filed their return. To claim the credit, taxpayers are required to file a paper return, instead of filing electronically. And they must attach documentation, including an adoption order or decree. The IRS says it typically takes six to eight weeks to receive a refund if the taxpayer has submitted a proper return. But to those parents whose refunds are being delayed because of the intense screening process, Lemons said the IRS apologizes. "This doesn't help out the people who claimed the credit and who deserve it ... we're sorry this is taking some time for those caught up in this," said Lemons. I lost my inheritance to the doomsday prophet!